“On this day in 1993, Mostar’s magnificent 16th century bridge, which crossed the River Neretva in southwestern Bosnia-Herzegovina, collapsed due to artillery shelling by Croat forces. The “”Stari Most”” or Old Bridge was a masterpiece of Ottoman architecture and a symbol of Mostar’s divided population. 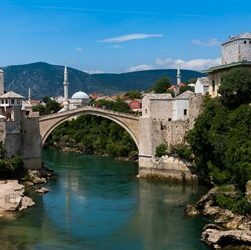 The bridge was originally built in 1566 on the orders of Suleiman the Magnificent, then Sultan of the Ottoman Empire, which included much of the Balkan peninsula, including Herzegovina with its historic capital, Mostar, at its center. The bridge was designed by Mimar Hajruddin, a student of Sinan who is considered the father of classic Ottoman architecture. Its simple design consisted of a single humpbacked arch made of locally quarried limestone, flanked by two large towers–built in the following century–on either side. The bridge was 30 metres long and 4 metres wide. Architects then and now praise the simplicity and grace of the original design. The bridge gave its name to the city of Mostar, and the beautiful limestone arch across the turquoise Neretva made the city famous. Over 400 years after its completion, the bridge was destroyed during the conflict that engulfed Bosnia. Under the command of Slobodan Praljak, the Croat militia shelled the bridge as part of its effort to drive Muslim Bosnians from the predominantly Catholic Croat western half of the city. The eastern half of Mostar, complete with stone mosques and minarets, is home to the majority of the city’s Muslim population. The diving line between the two halves is the Neretva River, over which the Stari Most crosses. Caption: The reconstructed Stari Most Bridge glistens on a sunny day.